This Pizza Soup could also be called Pasta Soup with White Beans and Sausage, but really? Isn’t “Pizza Soup” more fun? My cousin, Helene, gave me this recipe 6-7 years ago and my family has loved it from the very first bite. 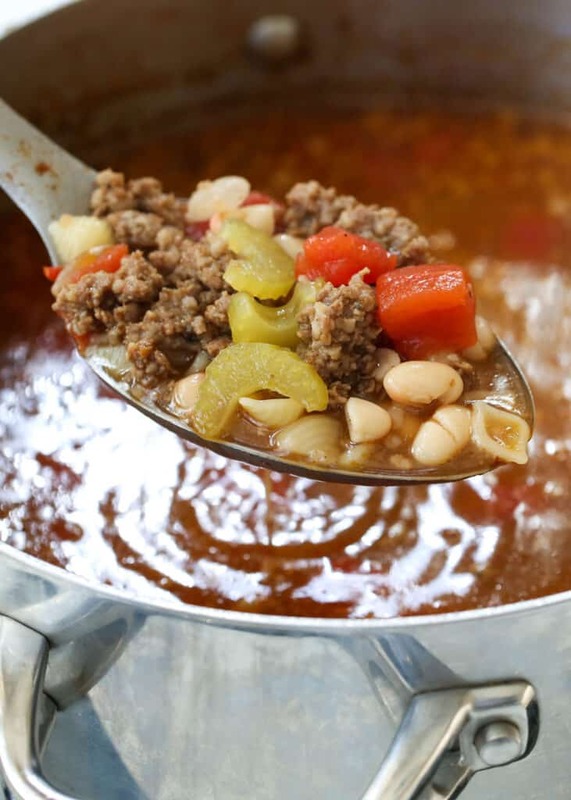 This soup is loaded with Italian flavor and full of beans, pasta and sausage. Helene’s family calls this Pizza Soup, because the house smells fantastic while it is simmering. It really does smell like pizza! This is one of the easiest soups I make. The sausage and tomatoes provide most of the flavor and you need to add no spices at all. This is my go-to, “I’m in the mood for soup, but have nothing planned ahead of time” meal. It could also be called, “I need to have dinner on the table in half an hour.” We all enjoy this and it is often on our menu. If you’re looking for more easy soup recipes, we love this Slow Cooker Busy Day Potato Soup and the Hearty Italian Vegetable Beef Soup is a staple in our freezer. 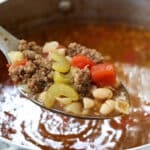 Creamy Taco Soup and Asian Chicken Noodle Soup are also great soups for quick and easy dinners. Kitchen Tip: I use this pot to make this recipe. 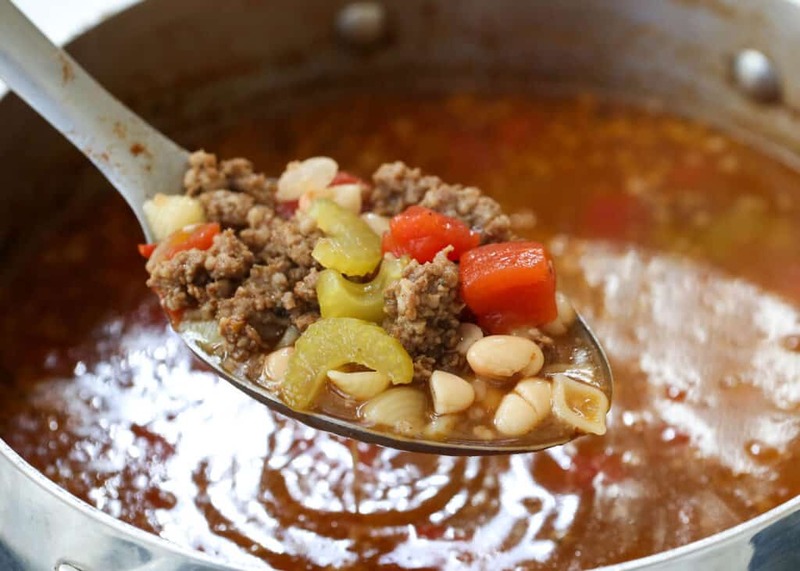 This could also be called " Pasta Soup with White Beans and Sausage," but the soup smells so much like pizza while it cooks, our name for it is Pizza Soup. In a large pot, cook and crumble the sausage over medium heat. Drain completely and then add all remaining ingredients except the pasta. Bring to a boil and then add the pasta shells. Once it is boiling again, reduce the heat and simmer until the pasta is tender, about 16-20 minutes. Enjoy! I like to use the teeny pasta found in the hispanic section of most grocery stores. This pasta is often called salad pasta or salad-size pasta. Most pasta will swell to double or triple the original size after cooking, so keep that in mind when selecting your pasta. All too often I feel that we forget about putting sausage into soup and it always tastes sooo good. Love the term of Pizza Soup! I like the way that you have put all the pizza ingredients into a nice and beautiful home-cooked soup. This is simply delicious! Hi Mary - ahh, I wished I came to see this post before dinner tonight. I have almost all these ingredients but didn't even come up a recipe like this. It would be a very nice comfort dish otherwise - we ended up eating leftover Japanese curry... I'll have to make it when I am back from my vacation. This looks like a wonderful soup for the family! I didn't use hot sausage. That was probably a mistake. I felt the soup needed more seasoning, so added seasonings - Italian, basil, oregano, garlic. About to serve -- we'll see what the family reviews are! this looks yummy! Definitely going to make this tomorrow.